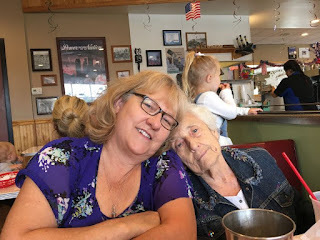 My dear and sweet mother died this past Tuesday 12/18. 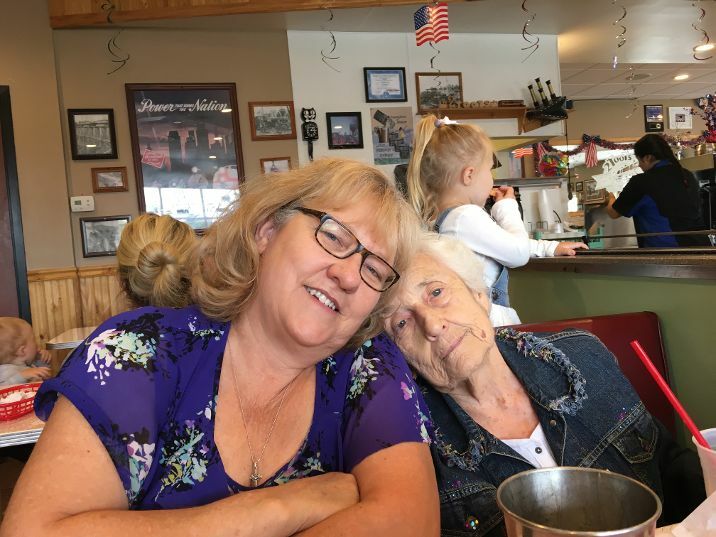 Her funeral was yesterday. That is where I have been. May she RIP! 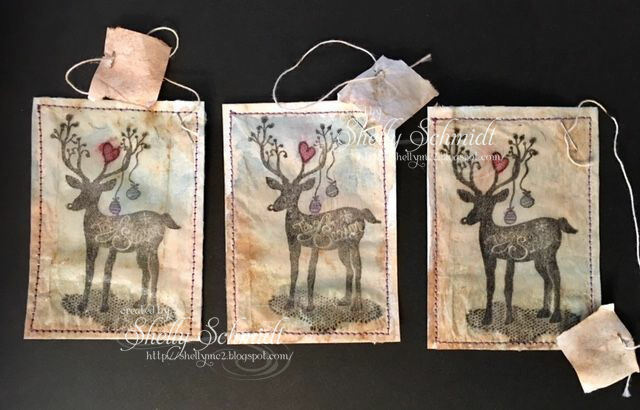 I stamped the image on the tea bags using Nuvo Hybrid Black ink. I let it dry..... I stitched the tea bags onto watercolor paper, and then watercolored over the top of the teabag. No two came out alike. In very small letters, it says 'Tis the Season. 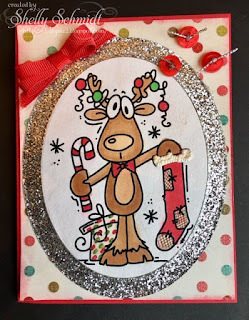 The kit I used is an Itty Bitty called Tis the Season Deer IB 779. 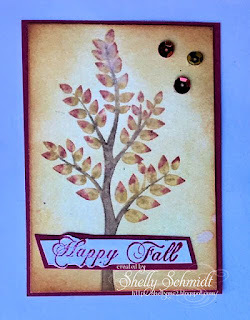 We make 2 ATC's each month, so the 2nd theme (which is optional to follow) was Fall. 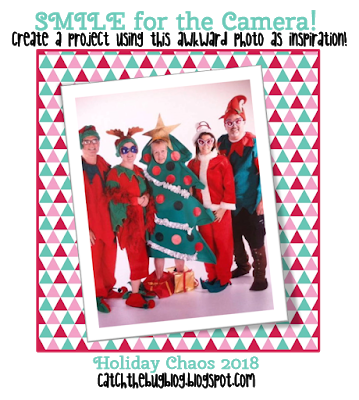 Today is the last and final day of Holiday Chaos over at Bugaboo. So many fun entries and a great way to make some last minute Christmas cards! 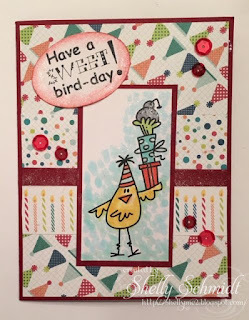 Our prompt today is B-I-N-G-O- you can check it out HERE! And, the image and sentiment are the Friday Freebie in the Bugaboo store today- do stop by!!! HERE is the link. I colored with Copics, and added Sparkle to Santa's Elf using Wink of Stella. The Sentiment came with the image. 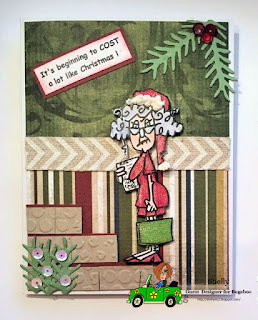 The greenery is a Cheery Lynn die and I used Wail Wasabi SU cardstock. The little touch of ribbon is also SU. 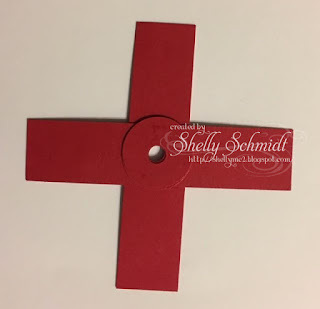 The touch of Red cardstock is Ruby Red SU. 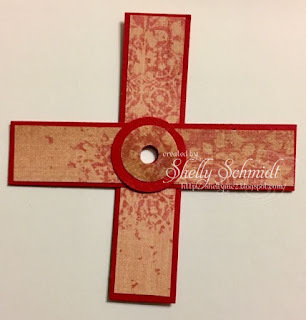 The tan embossed piece is a Tim Holtz EF. This week has been a blast! 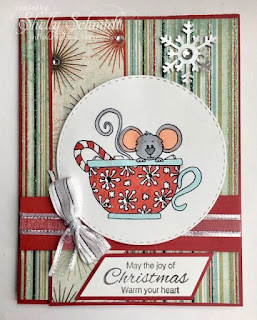 It has been so fun to join in as a GDT for Bugaboo for the Holiday Chaos, and I have 7 more Christmas cards done!!! I hope you are enjoying the prep for Christmas this year! This sweet digi is so fun- I am going to give this card to my sweet mother, who loves Hot Chocolate!!! I colored the image using Copic markers. I added some Wink of Stella to the white parts of the candy cane. The sentiment is from Artistic Impressions. The DP is MME Glittered Christmas papers (it's old,,,,!). 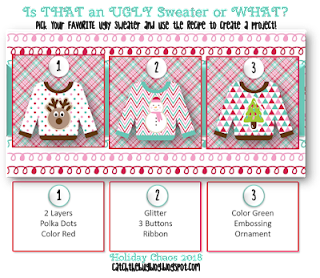 The cardstock is from Gina K.
Its Ugly Sweater Day at Bugaboo for the Holiday Chaos challenge for Day 4! I used the image Reindeer Christmas Goodies. I colored the reindeer with Copics. 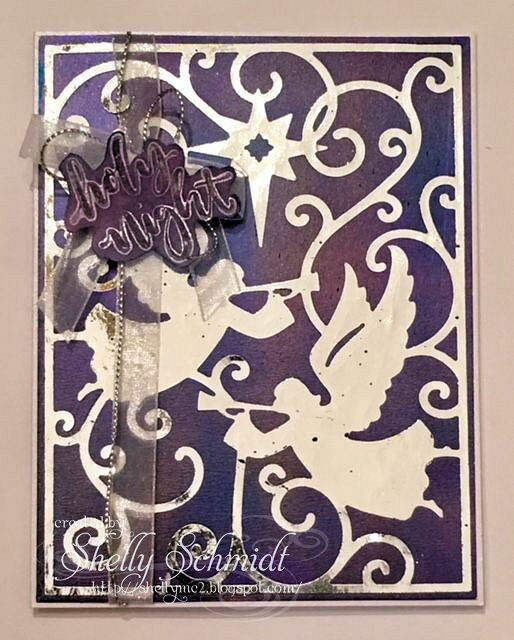 I used a MFT die to cut out the silver glitter outer panel. 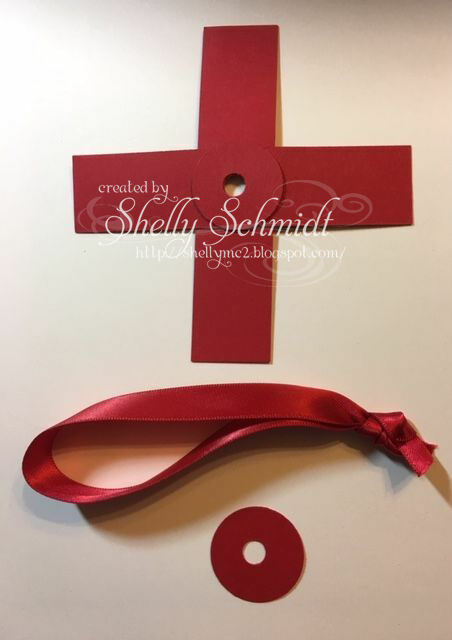 I added a red ribbon and three red buttons with cording included. (so under caption #2 for challenge). 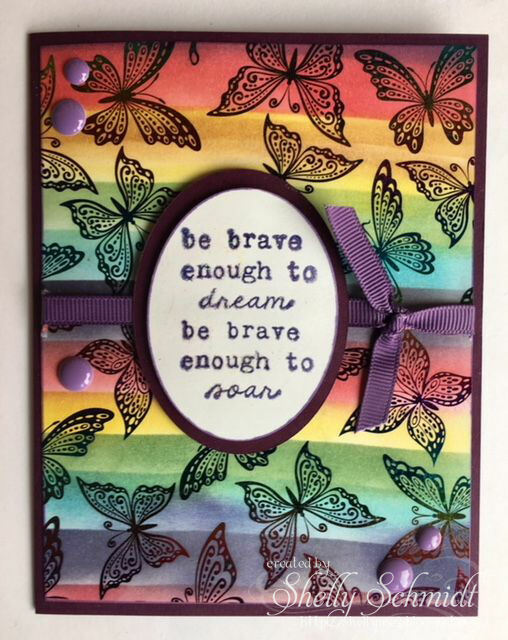 Copics are used to color in the sentiment and added spaces. The DP is MME. 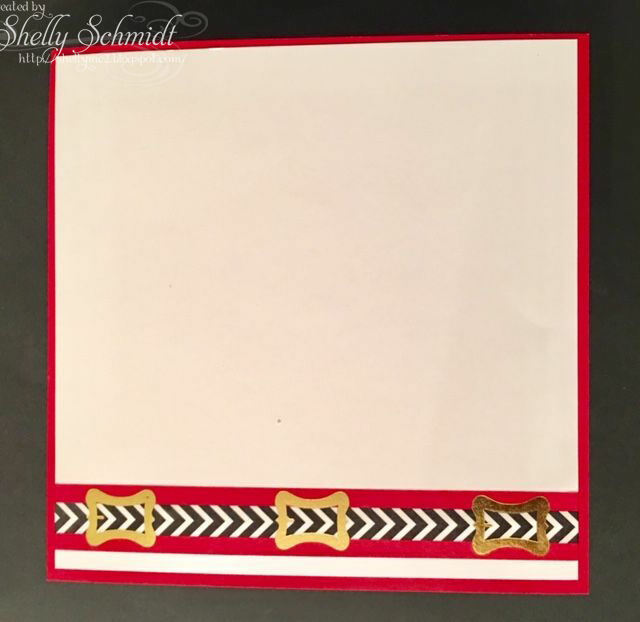 Cardstock is GP white and Gina K red. The entire panel with the reindeer is colored with clear Wink of Stella- so very shimmery! 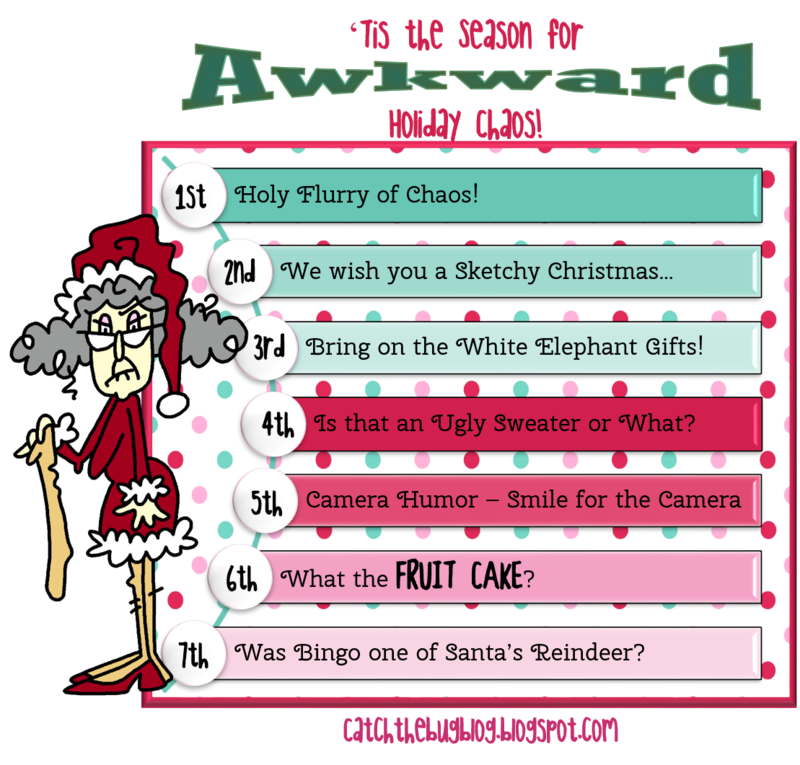 I hope you will join us for these fun challenges! There are lots of prizes to be won!!! I used SU Not Quite Navy cardstock, embossed with an embossing folder from Sweet Stamps. 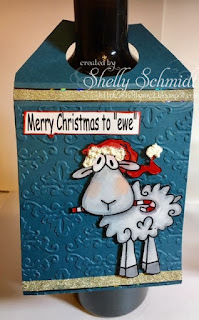 I added the fussy cut image Merry Christmas to Ewe and added it to the tag. The image was colored with Copic markers. I added liquid applique for texture : ) I added Washi and mini holographic Washi (that was a gift from Dr Sonja at SCS). I used the SU circle punch 1 3/4" for the top. I scored 2 lines at 2 1/2" and 3". The tag measures 7 3/8" long by 3 7/8" wide. I hope you will come join in this fun challenge week! You will get last minute Christmas cards or projects dome and will be in the running for some great prizes!!! 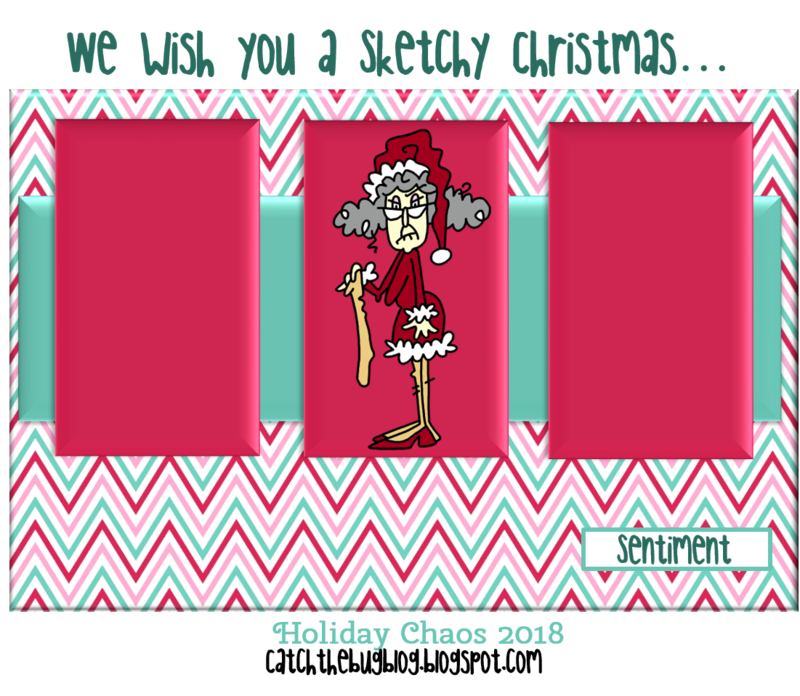 Day 2 of Holiday Chaos is a Sketch-- this is my absolute favorite challenge of any type! 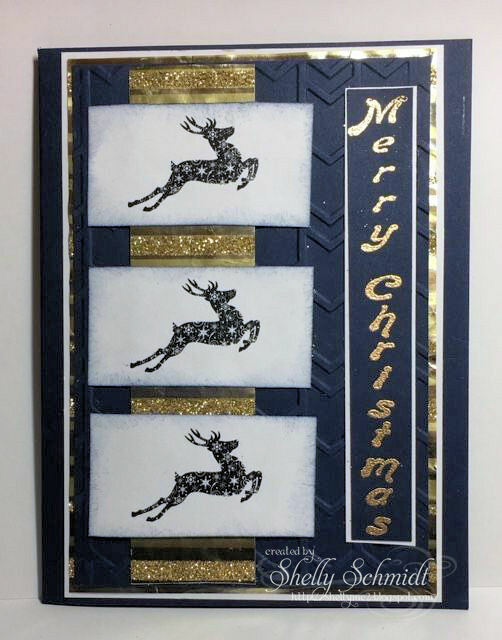 I turned the sketch on its side and used the Snowflake Reindeer Silhouette image for my card. Isn't this image beautiful??? I also used some gift wrap that I saved from last Christmas that I thought was fabulous! I layered it all on Navy SU cardstock. The sentiment is a red Rubber stamp- company unknown. 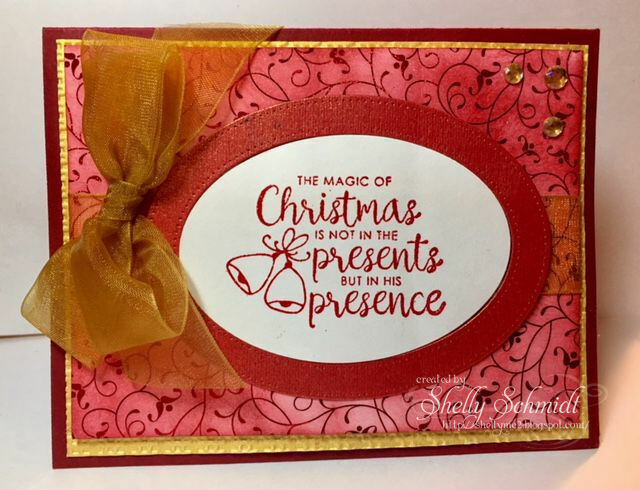 It is embossed using Ranger Queen's Gold EP. 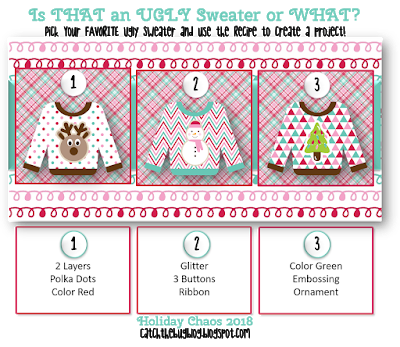 I hope to see you joining in the challenges at Bugaboo Holiday Chaos HERE- there are awesome prizes and if you enter each day, you could won one of the Grand prizes!!! Holy Flurry of Chaos at Bugaboo has started!!! 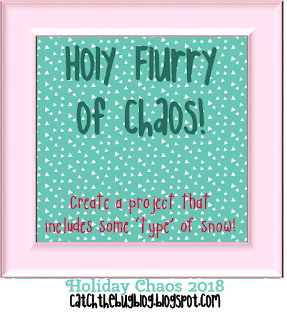 For Day 1, Create a project that includes 'some' type of Snow! I created using this fun JJ snowflake image, colored with Copics and I highlighted with a Wink of Stella shimmer pen. I added bling and added glossy accents to her glasses. 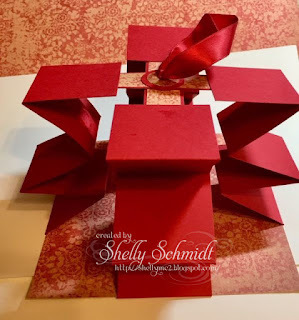 I used a Memory Box die cut using DP and added Bling. I also added twine and a snowflake charm. I hope you will come join us in the Christmas Chaos at Bugaboo- seven days of fun and lots and lots of prizes! 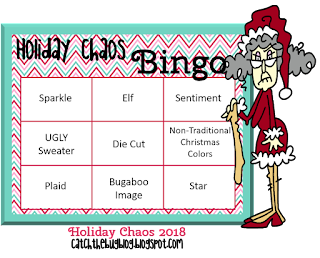 Each year I try to participate in the Holiday Chaos challenge at Bugaboo. 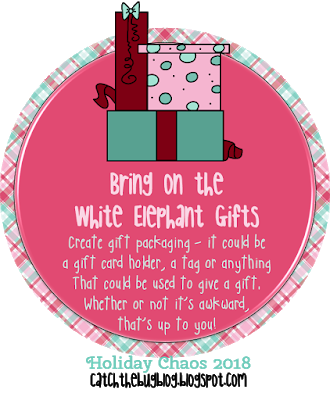 It is a card a day for 7 days, with lots and lots of daily prizes and a grand prize for those who post everyday. 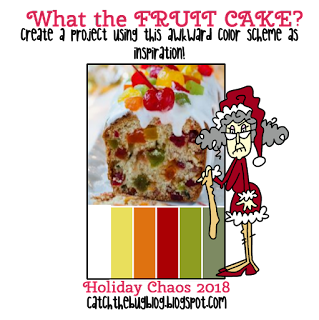 Well- just a note- Christmas Chaos begins Saturday 12/1!!! I hope you can carve out some time to play along!!! 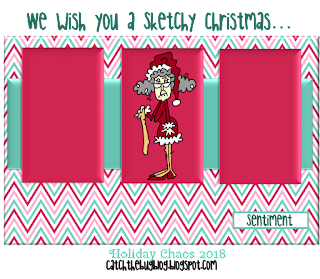 It lays flat to fit into the envelope, but once opened, it opens up to reveal the fun images or sentiments you add to it! I used 2 different Santa's on the card and a circle sentiment on the base in all 4 corners. This is akvsantahohoho. 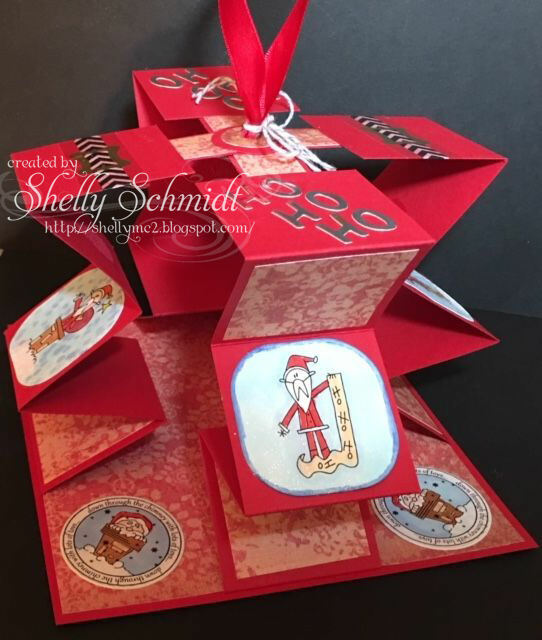 On the base in all 4 corners, I added Chimney Circle, in keeping with the Santa theme. .
For the base of the card, use the 6" square DP with a design. I glue the rest of the base together as the last step. (So it does not get dirty : ) If you are using thin DP consider adding a piece of cardstock for stability. 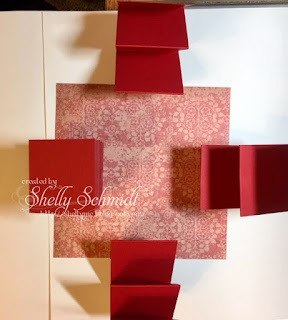 The first step is to glue the accordion folded strips to the base. Glue the last 2" square at the end of each strip to the (bottom) of the above 6" square. I penciled in an + in the center of the back of DP on my piece to center the accordion strips- see photo. *Each strip is 2" wide, so this guides you for centering. The strip will be glued in the middle third of the 6" square of DP- as shown in the picture. 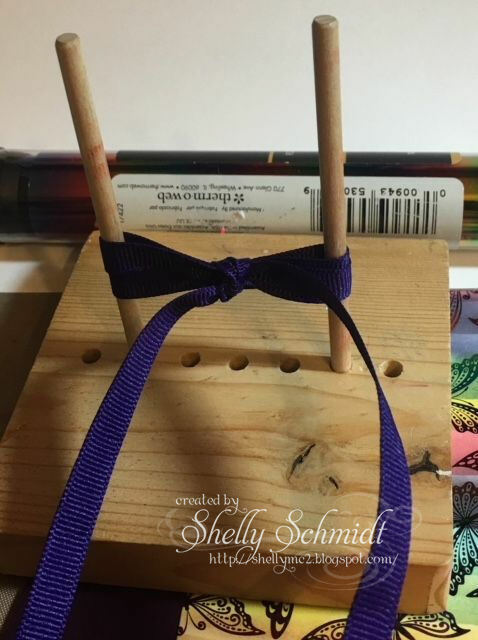 After I glue on the accordion strips, I am going to skip to another step- the top 'pull' area. If you look at online tutorials, they do this later, but it makes more sense to me to do this now. 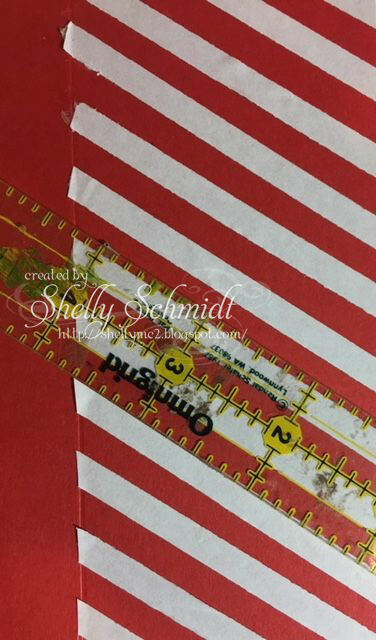 Glue the 7/8" x 3/34" strips as shown in the picture. This is the top of the + with DP showing. This is the + from the underside. Next, add the circles- these are stabilizers for holding the ribbon. 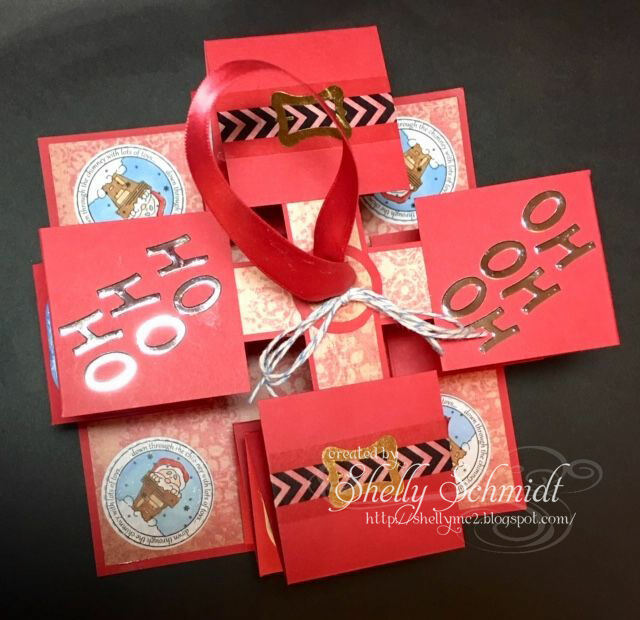 The circles that are 1" and 3/4" belong on the top, There are 2 1" circles that go on the underside- one has a hole punched it it, the other does not - they go on the underside, the one with no hole will cover up the ends of the ribbon. Next, add the last red circle (no hole punched in it) with hot glue to cover up the ribbon ends. OK, next we are going to glue this piece to the accordion strips. Place the edges of the top piece we just made (with the ribbon) under the top 2' x 2' square of the accordion strip. 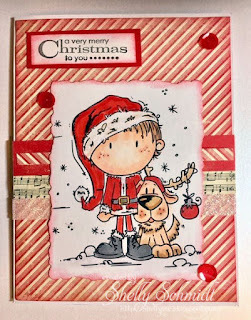 This is what your card should look like at this point- all ready to decorate! The HoHoHo in Silver Mirror cardstock (Sweet Stamps) was cut out using Alphabet Dies from Crafty Ann. 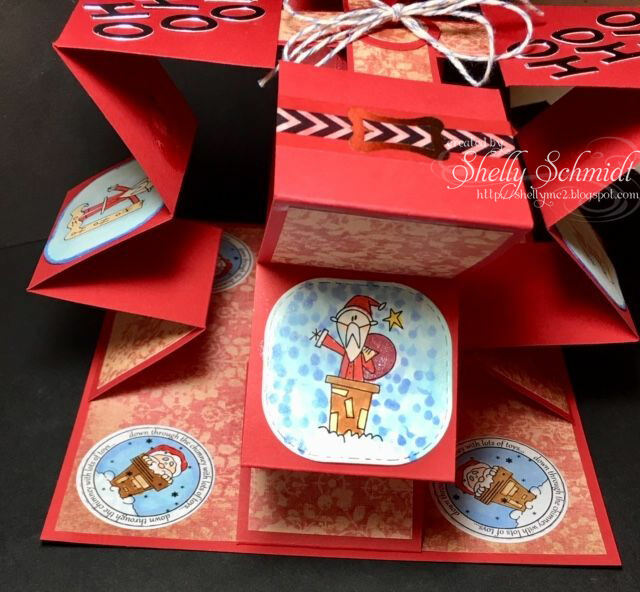 The akvSantas were cut out using a Die-Versions stitched die set. This is where I write my note- it is on the underside of the card- see why I wait until last to write a note? 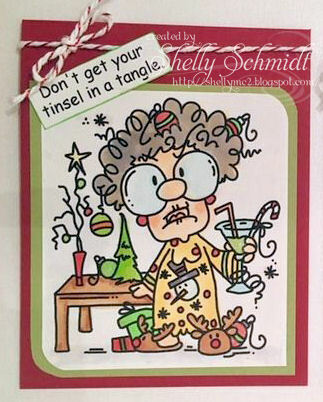 What a fun Holiday card, don't you think? It goes pretty quickly too. @ 2", 4", 6", 8", 10"
2- strips 7/8" x 3.25"
1 piece white 5.75" x 5.75"
Squares of white or coordinating DP 1.75" x 1.75"
The image was colored with Copics. 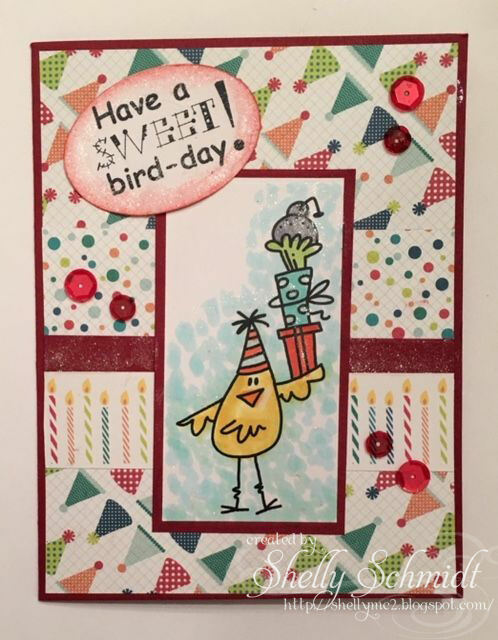 How fun it is to make sweet baby cards! Happy Sunday! 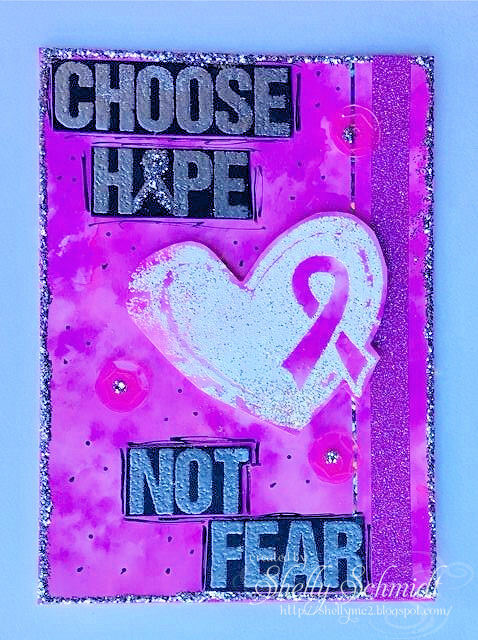 Today, a group of ladies and Gents that were GIU artists in September and October are hopping with more fun Unity cards! 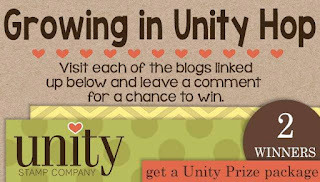 More chances for you to enjoy some inspiration and to WIN some fun Unity stamps! 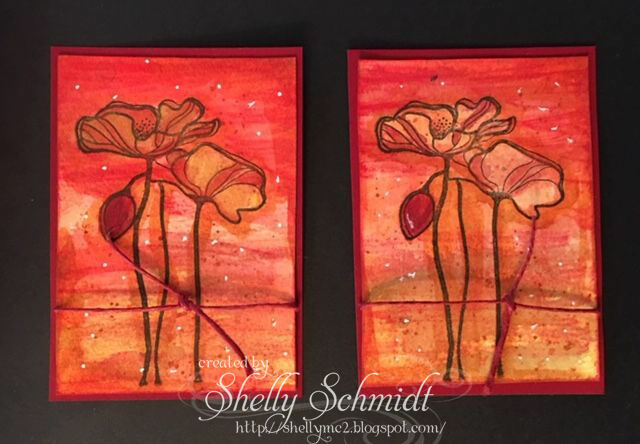 Thanks for stopping by- I have a couple of cards for today. 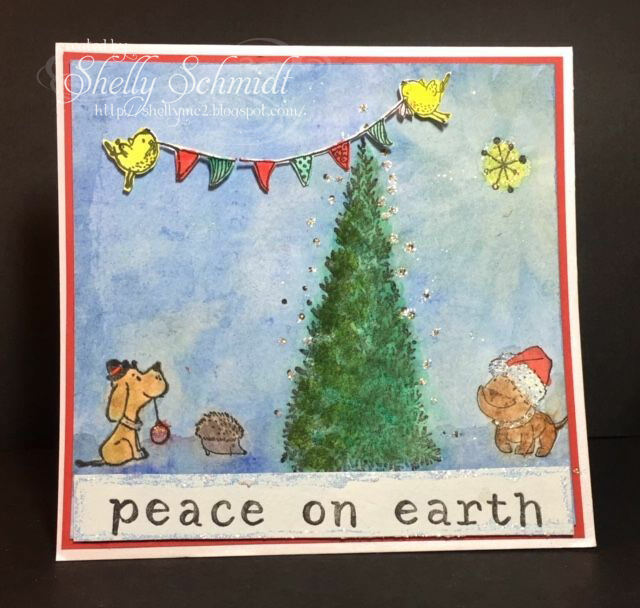 First, a fun and festive Christmas scene. This darling Unity set is called Woodland Festivities. This scene is watercolored using Daniel Smith paints. I added shimmer with Stickles. Next, a card for a family member that is going to become a mom for the first time- lots of changes in the future : ) And, that will make me a Grandmother! I just had to paper piece the image- I used mostly SU DSP from my stash. 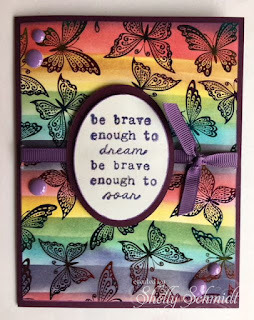 The embellishments are generic from my stash- dew drops which I have in every color : ) The die was purchased from ebay. I get an email alert there are comments and will come approve them shortly. 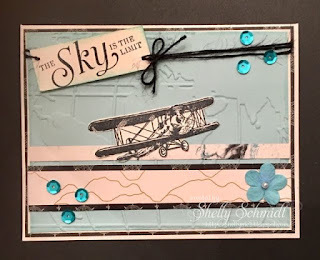 For the November Dueling Darlings challenge, LJ (Divas) and Darlene (Dazzlers) challenged us to create with the theme of National Aviation History Month. November is dedicated to exploring, recognizing and celebrating America's great contributions and achievements in the development of aviation. 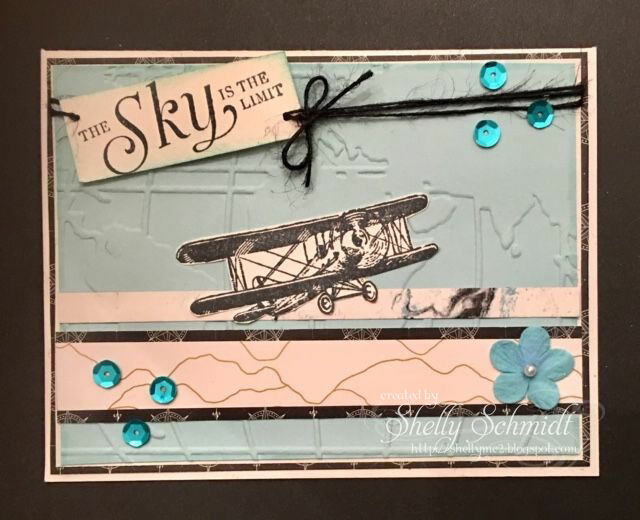 "Sky is the Limit" images by SU stamped in Memento Tuxedo Black on SU Very Vanilla cardstock. Sentiments are from the same set, same ink, same cardstock. DP is Going Places pack by SU. The EF is "World Traveler" by SU on Pool Party carstock, also by SU. Flower and sequins from Darlene's stash. I added black twine from my stash. 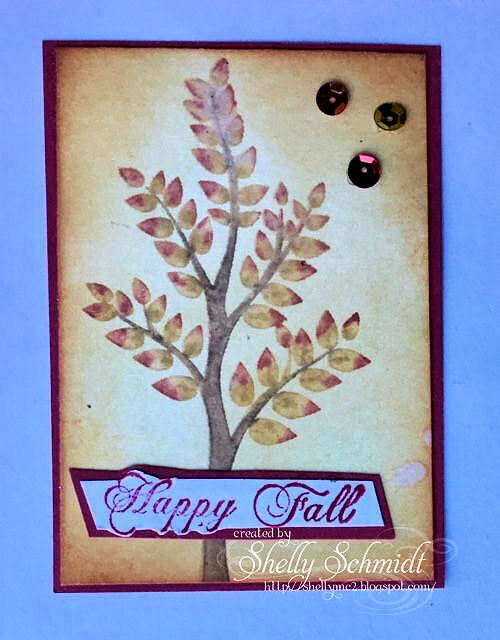 This Fall themed ATC started on white cardstock, I sponged on Distress inks. 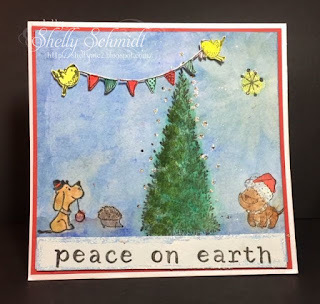 I colored the stamp with markers and huffed on it, then re-stamped. I pulled 4 names from my GIU week- for winning my blog candy. I had a little inspiration from the inside of an envelope. 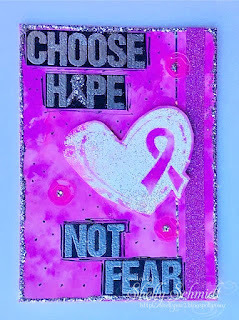 I am back in town Monday and will post winners of my blog candy from my week of GIU for Unity stamps. The winners of my week of GIU were Cindy Hodges and Beth Norman. Gosh, I do not get any older, so cannot imagine how these kids do!!! This card is for a nephew who is up to my shoulders this year!!! WOW! 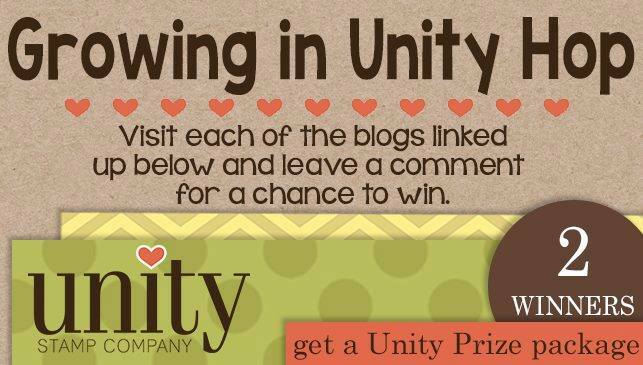 It's my last day of the Unity GIU week of posting. It has been so fun- thanks to everyone for such wonderful and encouraging comments!!! I have also had so much fun creating with foils- I had most of the supplies already- just spent about $13.00 for the week for the foiling supplies ! 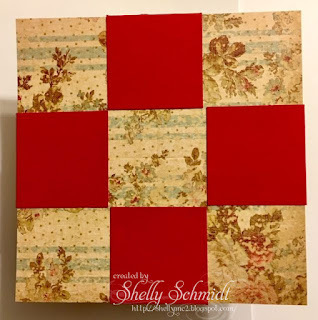 I saw THIS tutorial by Gracie of Gracielle Designs, and was smitten!!! I ordered the Rebekah Meier Mixed Media tape and the Mixed Media Medium. (You do NOT need a laminator when you use this). I used Distress Spray Broken China , then applied Broken China and Tumbled Glass Distress inks. 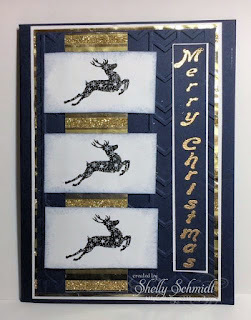 I stamped snowflakes from the Joy Girl kit in white ink, black ink and Chipped Sapphire ink. I added drops of White Ranger paint and silver paint to the background. The mixed media medium dries clear, so once dry, I wrinkled up the foil (iridescent- not sure of brand, Silver and gold) and dabbed them onto the three snowflakes. I stamped Christine Girl with Black Nuvo Hybrid ink and colored her with Copic markers. I fussy cut it out. I added Silver Mirror cardstock (Sweet Stamps) on the Teal cardstock, then applied the canvas Mixed Media Strips. Oh, how I love this!!! Next, I added the fussy cut and colored image. I stamped the sentiment in Teal, then in Versamark. 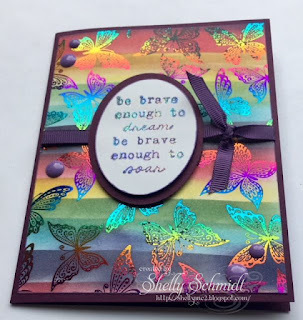 I embossed it with Stardust (shimmery) embossing powder. I added Liquid Applique for a puffy look to the edges of the shirt, skirt and hat. 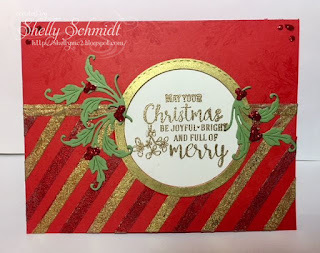 *I added Decofoil transfer adhesive by painting it onto the red snowflake she is holding and the flourish at her feet. Once dry, I added the foil....... * another way to use foil- paint it on just the area of the stamp where you want it. I used this large die by Die-Versions. 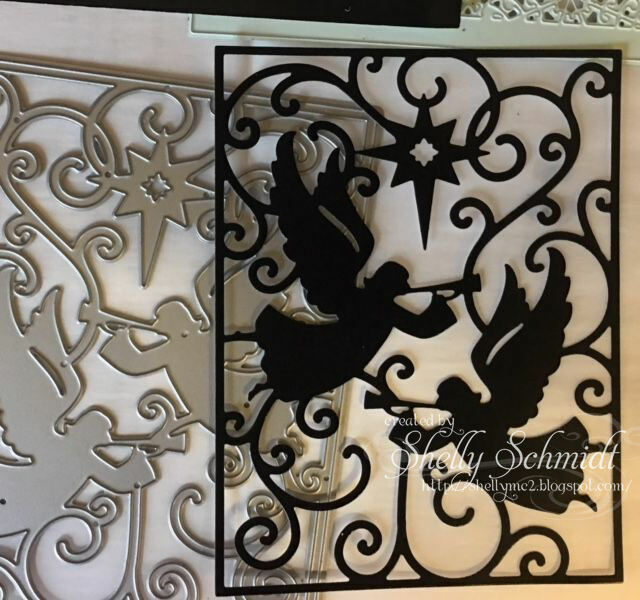 Cut the die and then foiled it- thru the laminator-so easy and stunning! This is so pretty IRL! I added a sentiment from the Woodland Festivities kit. 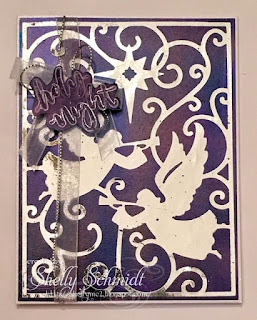 I dabbed on Decofoil transfer gel to the stamp, stamped it, let it dry then foiled it. 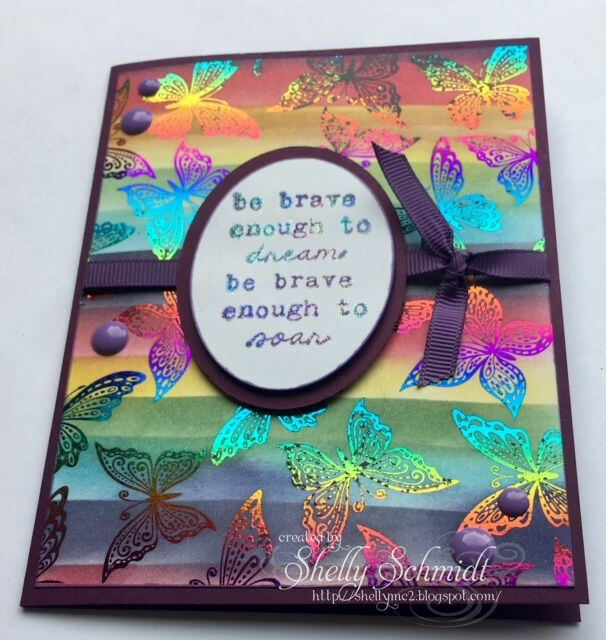 I sponged over the foiled sentiment with distress inks. I fussy cut it out and added it over the bow. I made a Splitcoast listing of foiling techniques. 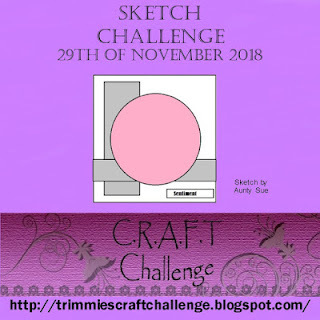 Please stop by and add any new techniques- would love to see what you have done!!! 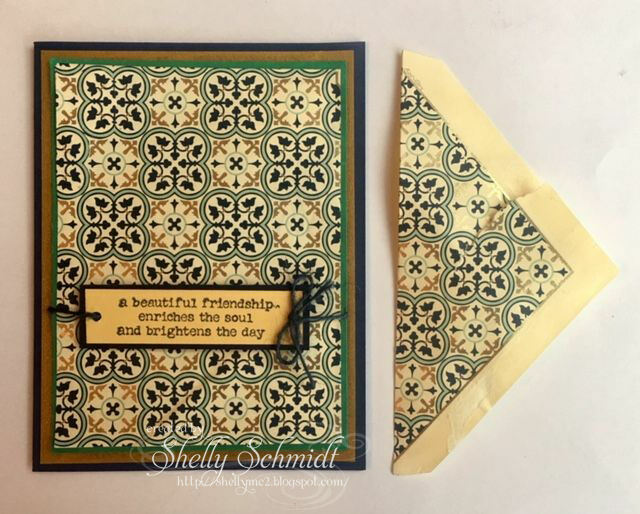 If you leave a comment each day, you will have a chance to win one of two fabulous grab bags of 25 stamps from Unity Stamps! 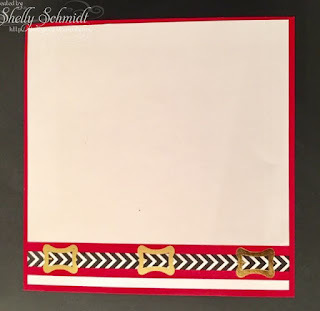 For this card, I placed strips of 1/4" double side adhesive tape every 1/4" and alternated the red and gold foils. The ruler is a quilting ruler- it has great markings on it for measurements. 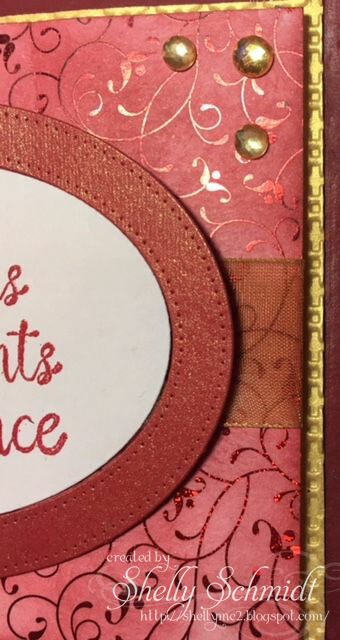 On my card, I added a gold frame around the sentiment using a Memory Box stitched die. 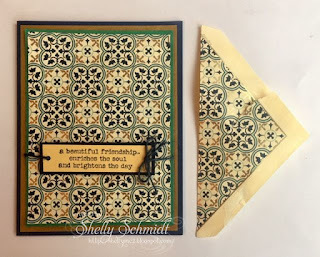 The leaf die is from Sweet Stamps. I added red Stickles for accent. There is a Unity Christmas tree stamped in Versamark on the top.